Popular TV chef Rick Stein scours England in search of delicious treats to put into a Christmas hamper. From free-range turkeys, to hams and artisan cheeses, Stein discovers plenty of lovingly produced delicacies for the Christmas table. However, the traditional turkey isn’t Stein’s favourite festive food. “I prefer goose to turkey and there’s much less meat on a goose. It’s a bit of a relief really because you don’t find yourself eating goose all the week after Christmas; as you do with turkey,” says Stein. 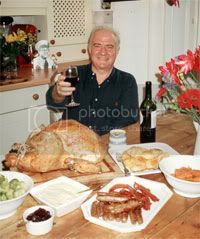 So Stein is particularly impressed when his favourite food writer Matthew Fort treats him to cold roast goose with a simple salad for this Christmas special. He also hooks up with wine expert Oz Clarke to sample Nyetimber Vineyard’s award-winning English sparkling wine and enjoys a belt-loosening session with the members of the Pudding Club putting various Christmas puddings to the taste test. Sadly, this is the last time that Rick is accompanied by his four-legged co-star Chalky, as the little dog is getting somewhat old and doddery. However, as his last hurrah, the plucky Jack Russell terrier does get to tour around in a Land Rover dressed up as Santa. However, I have a qustion. What was the music played on the show.? It was a french accoustic song and I realy liked it.